Following a two-week delay, the Japan Aerospace Exploration Agency (JAXA) successfully launched their new, reportedly less expensive Epsilon Launch Vehicle (Epsilon-1) early Saturday morning. In a statement, JAXA officials confirmed that Epsilon-1, which was carrying the Spectroscopic Planet Observatory for Recognition of Interaction of Atmosphere (SPRINT-A) remote observation telescope, lifted off from the Uchinoura Space Center in Kagoshima at 2:00pm local time (0500 GMT/1:00am EDT). According to the AFP news agency, Saturday’s launch was coordinated and controlled by two laptop computers from a nearby command center, and drew spectators both at the Kagoshima facility and at a public viewing location in Tokyo. The news agency reported that over 900 space enthusiasts gathered to watch the liftoff in the Japanese capital, clapping and snapping cellphone photos as the 24 meters (79 feet) long, 91 metric ton Epsilon-1 launched. The vehicle then successfully deployed SPRINT-A at an altitude of approximately 1,000 kilometers (620 miles). A previous launch, which had been scheduled for August 27, had been aborted just 19 seconds before liftoff due to a computer glitch, the Associated Press (AP) reported. That glitch involved the erroneous reporting of a positional abnormality, and forced the Epsilon-1 launch to be postponed for a period of two weeks, AFP added. 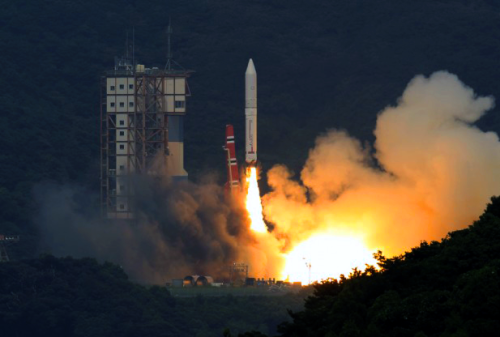 In fact, JAXA officials told the AP that the Epsilon – the nation’s first new rocket design since the introduction of the H2A in 2001 – costs about one-third as much as its predecessor, at 3.8 billion yen ($40 million). It is also half the size of the H2A, the wire service noted, and can be assembled and prepared for launch in just one week’s time. “Japan hopes the rocket, launched with just two laptop computers in a pared-down command center, will become competitive in the global space business,” AFP noted. They also pointed out that a crew of just eight people are required to complete launch procedures, compared to a staff of 150 for the H2A.